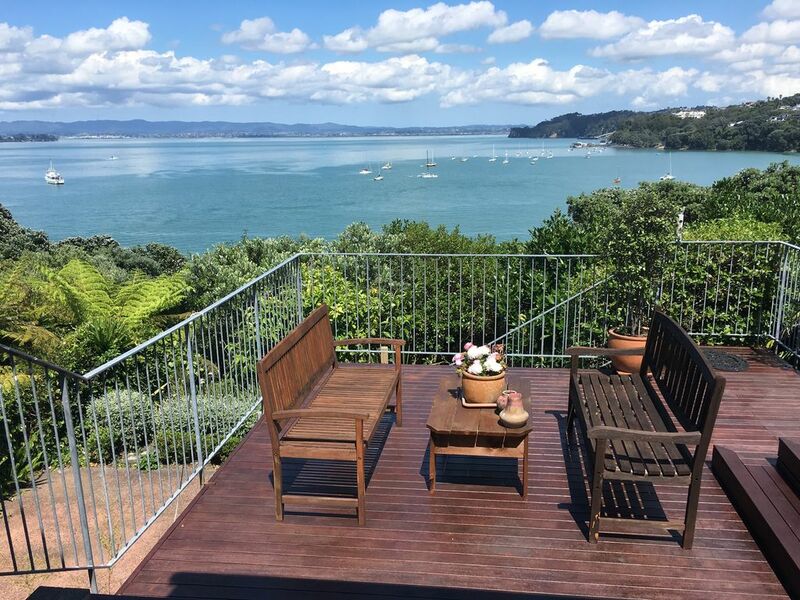 Our house is perched on the edge of the Waitemata harbour. We are ideally placed for a holiday; the Northcote tavern is over the road (excellent food), the ferry terminal to the bottom of Queen street is a short walk. The Bridgeway theatre complex, cafes and restaurants are just as close in the other direction. Our house is a modernised villa with four bedrooms and two luxurious new bathrooms. Well equipped kitchen, elegant indoor and outdoor dining, TV lounge and many outdoor seating areas. Our house has unbelievable waterviews and every night the sun performs its dramatic exit. There are loads of outdoor spaces to sit and enjoy the lavish gardens. The house is a hundred year old villa that has been renovated in every respect. It has brilliant outdoor flow, a 50 square metre deck and a return verandah. There are three separate common areas; each can be closed off. A TV room (we have Sky sport and Netflix), a viewing room with telescope and binoculars and bifold doors, a diningroom with bi-fold windows on two sides. We have more than 1000 square metres running down to the sea, with steps and lookouts. The native trees attract a variety of bird life. From the back deck we see amazing things; the Spirit of New Zealand, pods of orca, a parade of super-yachts, regattas and waka races. The whole house is yours except for the garage where we store our supplies. The yard is completely secured with electric gates, CC TV, and on the watery side a ten foot cliff. I live fifteen minutes away and can help with any guest problem that should arise. I have lived in Auckland all my adult life so I can make suggestions about dining, shopping, transport and entertainment. We stayed as a family ( of adults) and thoroughly enjoyed every moment of this amazing property, complete with million dollar views from the deck and spa that overlooked the harbour. The kitchen was well appointed and the fridge was extremely well stocked with everything you could need! The beds were so comfortable and all the bathrooms had underfloor heating and were newly renovated. There was also temperature control throughout to make the house comfortable should you need it and excellent security. Ted and Jane also have wonderful taste and the property is filled with excellent music, books and artwork. The garden at the front of the property was also beautiful and there are wonderful eating places just across the road, or a short walk down the road. There is even a cinema and fish and chip shop nearby! The property also has off street parking and was so conveniently located. We would all stay here again in a heartbeat! Thank you for sharing such a wonderful home.